Wyatt is a good example of local rescues working together. Cal called Dezi to go with him for the actual rescue, and if I remember correctly Dezi had already seen the cry for help and was lacing up his boots. Cal asked for donations (to make sure vetting was covered) and Dezi fostered/rehabilitated/and adopted out Wyatt from his Recycled Rovers facility. Without the help of our "village" success stories like this would not be possible. Ellie was found with mange. She was only about a month old. Mr. Big dog was found in along side the road in Donna, TX. 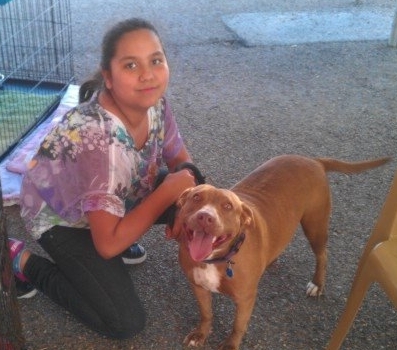 Morgan was found in a big drainage ditch by a couple teens who were dirt biking in the area. If it wasn't for them he would of NEVER been found. This is another one who had a bad case of mange. Gordo was rescued from a place that was "supposed" to be a sanctuary. Chief had a severe case of mange. He was in really bad shape. 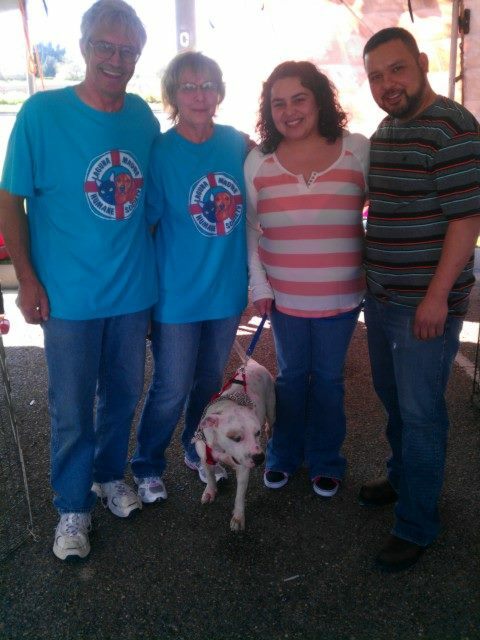 Here is Buster at an adoption event. Ellie today. She was a foster failure. and spends her time with Missy (who is looking for a home) and helping out other dogs rescue dogs who are shy. Mr. Big Dog with his new family!! Morgan is a little older now and is looking beautiful in his home! Gordo ended up going on a transport up north with the Paw Posse! BUT here he is with a beautiful coat in his own home! Buster with his new family. Lois, this beautiful girl was found in an empty field near a trash dump site. She was in foster for a good month, When she found her home she was the happiest dog even...Then her home fell apart and she was given back to her foster. After a few weeks she was adopted out once again and as it turned out, she didn't really bond well with her new owner so she came BACK to her foster who found her. After a couple months her first momma was able to get on her feet again and found out she was up for adoption again and was really excited. Lois is now living with her first mom and everyday is being loved more than the last. Here Lois is in her forever mom's home. As you can tell she is loved beyond words. This is how every animal deserves to live. We pickup so many "thrown-away" dogs from the Donna Dump in Donna Texas. All most ALL of them have been treated and rehabilitated to make someone a good house dog. Sadly we have to say "almost" all because there are some that have been neglected for so long that it's medically impossible to make them whole again. But when we get a picture like this one ... waiting for us when we open our computers in the morning ... it makes our DAY and makes all our efforts and trials worthwhile. This dog was a little itty bitty puppy found in the piles of trash. How do people do this, and how can we drive away when we see them? Fosters are desperately needed as we don't have room for them all. If you can help, would mean opening your heart and home while they recover, please send us a message. This poor guy was found on Halloween 2013 at a small city dump site. He was underweight and malnourished (anemic). He was shot at least twice as we've pull both buck and bird shot from his face, ears, and down his back. He is heart worm positive, and has a tick disease, for which he's receiving treatments. He is up-to-date on all shots but has yet to be neutered because of his medical conditions. Even after all that he has been through, he is still one of the most affectionate dogs ever. He gaining strength daily and loves his walk-abouts. Ivory has found a home with a lovely family. He is now living in paradise! This little kitten is about 5 months old. He is a SURVIVOR! He was found stuffed in a wall at a warehouse. He is the only survivor of his litter. He's extremely playful and loves attention. All ready for his new home, up-to-date on vaccines and has been neutered. To finding her new loving home! !